Our "Fridays @ 12:30 Concert Series" features guest artists from around the world, our internationally renowned faculty, and our talented students. Our 2018-2019 guests include world-renowned soprano and Western alumna Adrianne Pieczonka, who joins us for Homecoming and our Music Builiding Grand Opening, and Oscar® and Grammy®-nominated artist and Western alumnus Stephan Moccio who joins us as part of our JUNO week celebrations. We also have special guests who share their knowledge and expertice with our students as Artists in Residence, as guest lecturers for Voice Fridays, and for our Masterclasses. 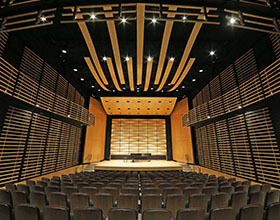 All of our Guest Artists events can be found on the Don Wright Faculty of Music Calendar of Events. Wednesday, January 23, 6:00 p.m.
Annemarie Moorcroft, principal violist of the German Symphony Orchestra of Berlin, appears in recital with guest violinist Elissa Lee of Ensemble Made In Canada.